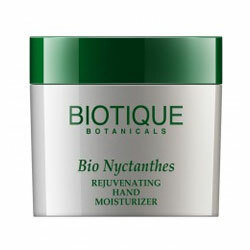 Keep hands moisturized, younger-looking and free from germs and dryness. This rejuvenating, anti-bacterial lotion is a glove of protection with a hydrating blend of pure nyctanthes, Indian madder, margosa bark, sunflower oil and red sandalwood, to keep hands moisturized, younger-looking and free from germs and dryness. Nyctanthes is an anti-bacterial, anti-inflammatory, aphrodisiacal Indian tree with flowers that awaken body and senses. Pump a generous amount into palms and massage into hands until absorbed.